This Christmas baking and cooking digital kit will delight even those who prefer to have Christmas dinner cooked by someone else! All of the necessary ingredients are here for you to create inspiring Christmas cards, scrapbook layouts and mini albums. The flour and sugar containers, the utensils, and of course the mixmaster are sure to be on your list to create with, but don't gloss over the recipe cards, journal labels and tabs with writeable areas which all would work so well to even create a family recipe album, layout or card. There's so much to see and design with in this kit....it's like the overwhelming food on your Christmas dinner table. Dig in ... and this won't make you gain even an ounce! 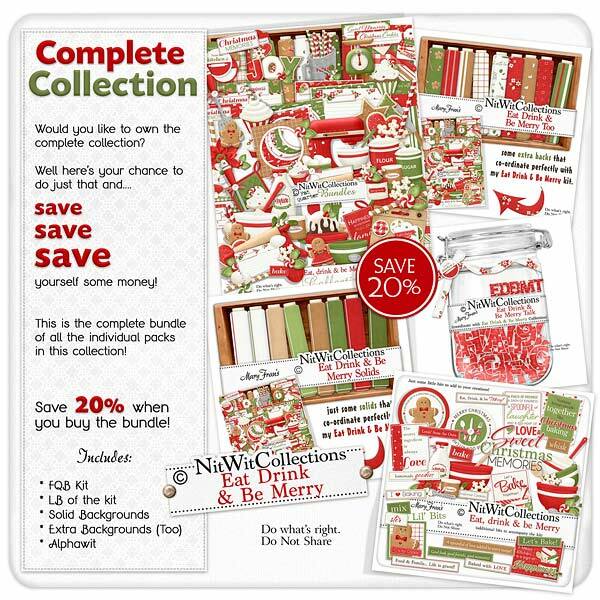 A Digital Scrapbooking Kit and Card Making Kit from Nitwit Collections™. Visit our Inspiration Gallery for larger photos and more ideas!